flickr: northern_bites / photo: robocup2006. UPDATE:: Here’s a list of teams that qualified. Over 39 35 teams applied, twelve of which were guaranteed qualification from last year’s performance! UPDATE x2:: Lots of Chatter going on in the four-legged league mailing list including a message sent by the head honcho of the league concerning the qualification process: Legged Qualification FAQ. UPDATE x3:: 35 Teams applied. 12 Prequalified. 11 were let in by committee. Northern Bites is only one of three teams selected as first-year applicants to the World Championship! Northern Bites accepted to the Nao league!!! 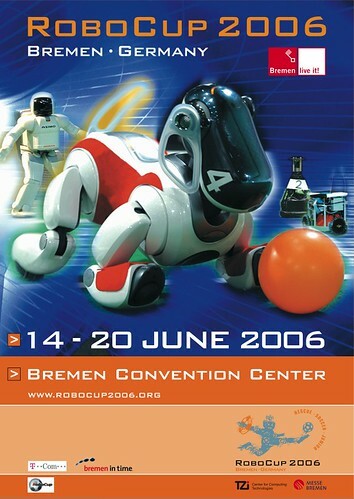 This entry was posted in RoboCup on February 28, 2006 by hwork.